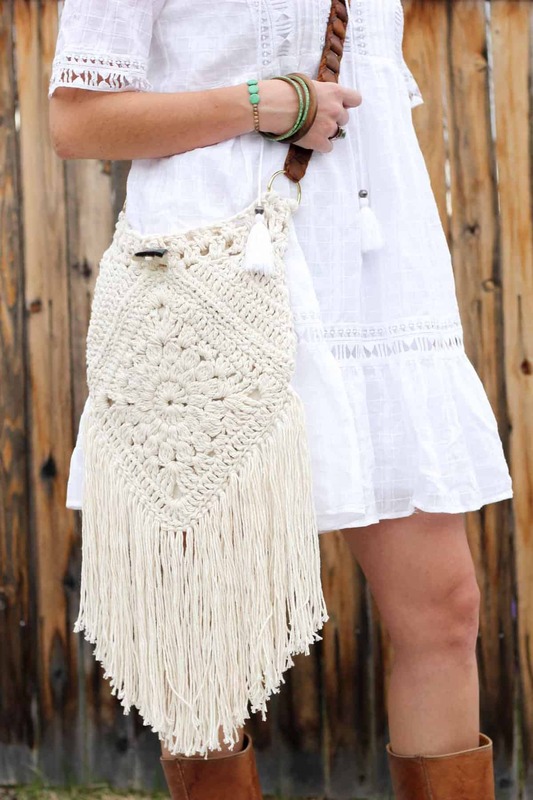 This boho bag free crochet pattern is fun to put together and loaded with bohemian charm. The free pattern is below or you can purchase the ad-free, printable PDF for $2.75 here. 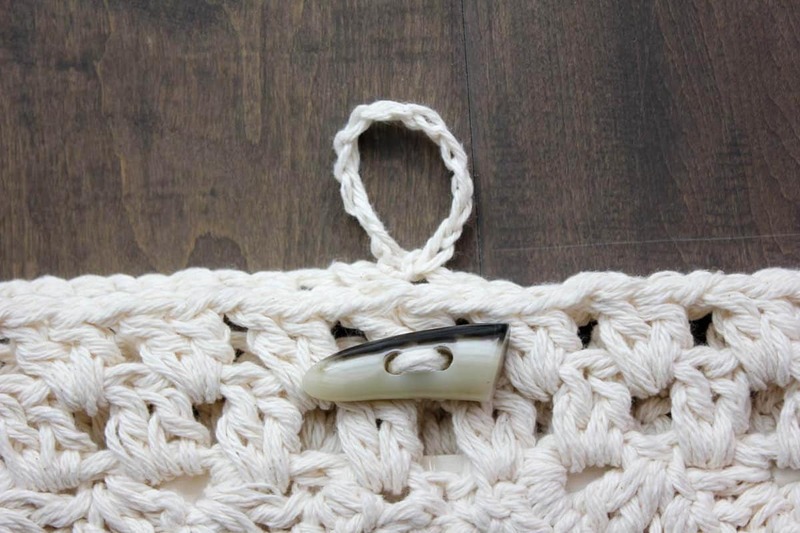 This free crochet urban gypsy boho bag pattern is a collaboration with my friends at Lion Brand Yarn. This post contains affiliate links. UPDATE: When I originally named this pattern the Urban Gypsy Boho Bag, I had no idea that the word “gypsy” had a was derogatory. It’s been brought to my attention now, so I’ve changed the name slightly. The pattern is still the same! During homecoming week in high school, we always had a “70’s day” where everyone would dress up in bellbottoms and bandanas. As child of a woman who is both a certifiable hippy AND prolific crocheter, I always had the best “70’s day” costumes. Authentic granny squares. Legit embroidery. Fringe for days. My mom’s closet is like a time capsule. Perhaps I’ve been trying to ensure the same future wardrobe options for my own daughters because I’ve really been on a bohemian kick lately. 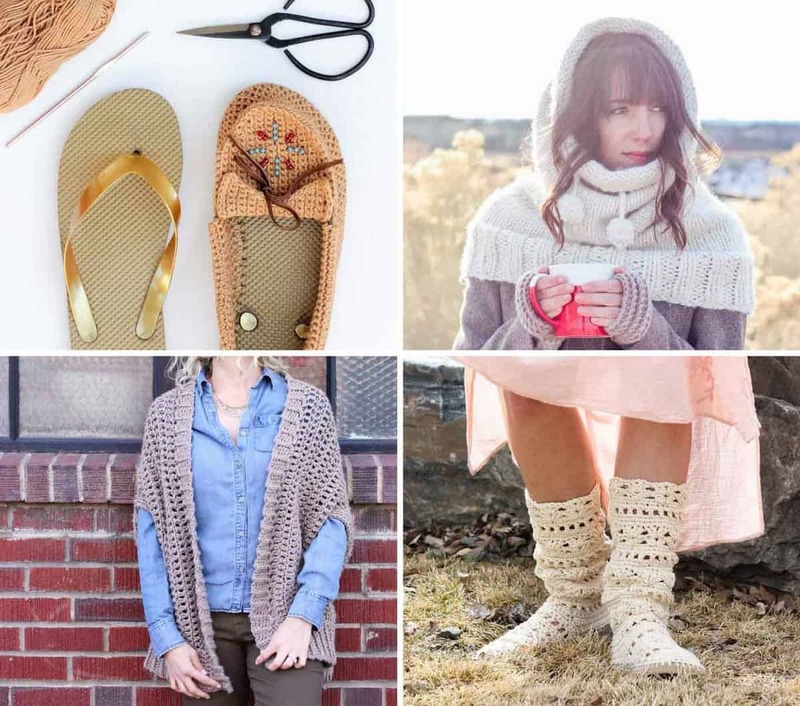 First it was my crochet moccasins, then “The Huggle” hooded cowl, next the Cocoon Cardigan pattern, my Coachella Boots with flip flop soles and now this crochet purse pattern that fits squarely in the “boho” category. 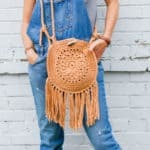 I came across this boho bag for sale a little while ago and loved how it came to a point at the bottom. I set out to design something similar with a series of simple shapes. Then later I saw this gorgeous medallion, and while there’s no pattern associated with it, it inspired me to work out my own that would suit the bag I was dreaming up. 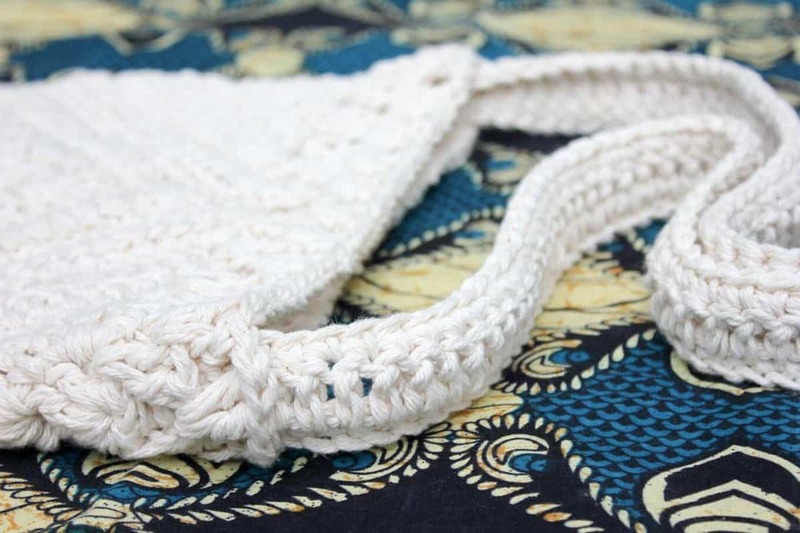 For this Urban Gypsy boho bag free crochet pattern, I’ve included two purse strap options. 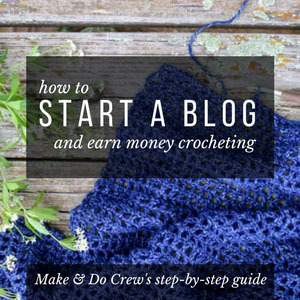 The first and most straight forward is a basic crochet strap that is sturdy, functional and customizable. This strap works up in three rows, so it’s quick too. To attach my leather strap to my boho bag, I used pliers to separate D-rings wide enough that the belt could slip onto them and then just sewed the D-rings directly onto the purse. This worked because by the grace of the thrifting gods, my belt happened to already be looped at either end. 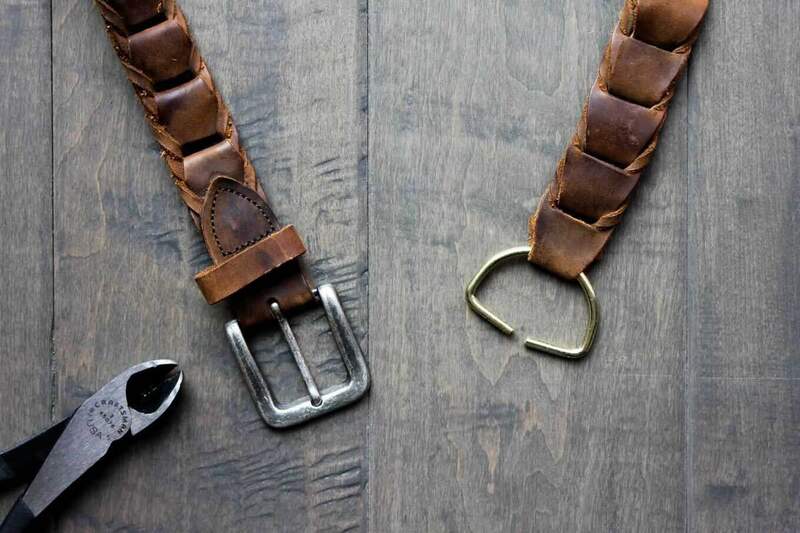 Most belts though won’t be like this and you’ll want to use rivets to create your own loops. 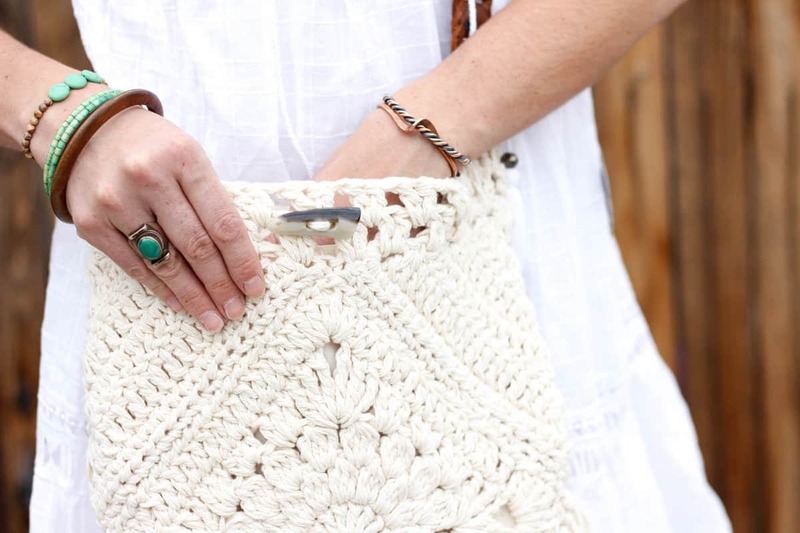 Persia Lou has an awesome tutorial on how to do this in her own gorgeous boho bag pattern. Seven pages of step-by-step photos are separated from the written pattern so you can choose to print them or conserve ink. 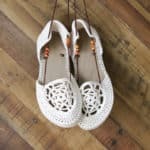 So you can spend more time being a boho goddess and less time shopping, this post contains affiliate links at no extra cost to you. Gauge isn’t critical, but for reference, each square panel measures about 8.5”. 2DcCl – 2 double crochet cluster – yo, insert hook in the designated stitch, yo and pull a loop up, yo and pull through 2 (2 loops on hook). Yo, insert hook same stitch, yo and pull up a loop, yo and pull through 2 loops (3 loops on hook). Yo and pull through all 3 loops. 3DcCl – 3 double crochet cluster – yo, insert hook in the designated stitch, yo and pull a loop up, yo and pull through 2 (2 loops on hook). Yo, insert hook same stitch, yo and pull up a loop, yo and pull through 2 loops (3 loops on hook). Yo, insert hook in same stitch, yo and pull up a loop, yo and pull through 2 (4 loops on hook). Yo and pull through all 4 loops. 4DcCl – 4 double crochet cluster – yo, insert hook in the designated stitch, yo and pull a loop up, yo and pull through 2 (2 loops on hook). Yo, insert hook same stitch, yo and pull up a loop, yo and pull through 2 loops (3 loops on hook). Yo, insert hook in same stitch, yo and pull up a loop, yo and pull through 2 (4 loops on hook). Yo, insert hook in same stitch, yo and pull up a loop, yo and pull through 2 (5 loops on hook). Yo and pull through all 5 loops. • Pattern is worked with two strands held together throughout. • Two square panels and two triangle panels are worked and then sewn together. A top border is added as well as a strap and optional fabric lining. Fasten off leaving a 15” tail for sewing panels together. • See photo below for clarification on how bag panels are sewn together. Place squares on top of each other, right sides facing out. Using stitch markers or safety pins, pin each corner together. Pin one triangle to the right of top square, aligning bottom corner with corner of square. One stitch of triangle will overhang the top of the square. This will be sewn to the second triangle. Use the mattress stitch to sew the right triangle and square edge together. Pin second triangle to the left side of square. Pin overhanging stitches on triangles together. Repeat steps 3-6 on second side. • Round 1 is worked into the last stitches in the rows of the triangle panels. Each row on the triangle will have two double crochets worked into it for a total of 24 sets of 2 double crochets. 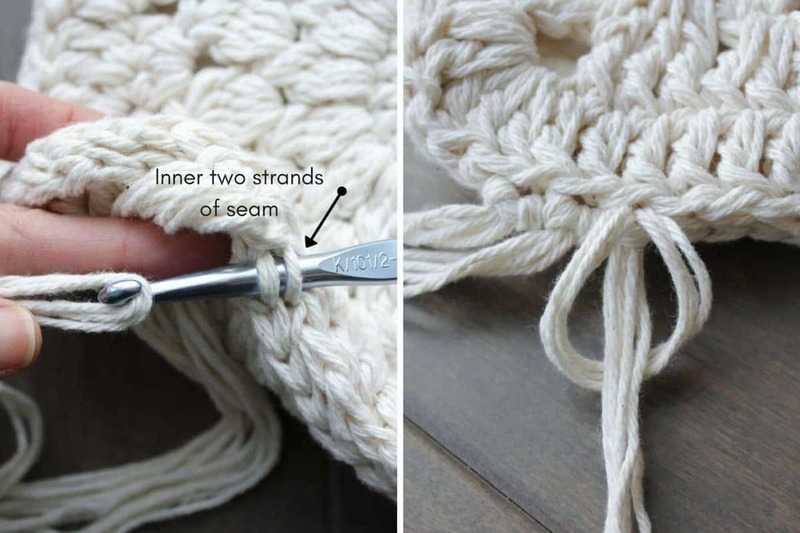 Using two strands of yarn, tie a slip knot around hook. Insert hook at left side of bag—in space just to the left of the magic loop that begun the triangle. (This is Row 1 of the triangle.) 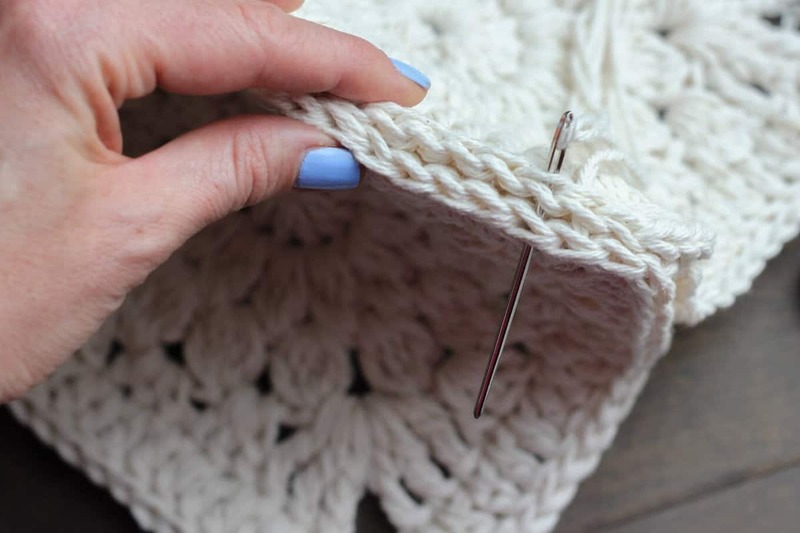 Left handed crocheters—join yarn just to the right of the magic loop. • Feel free to adjust length of chain based on your desired strap length taking into consideration that the strap will stretch slightly. As written, the strap is 52” long, with a height of about 22” once sewn on. Foundation Row: Ch 130; turn. Row 1: Sc in second ch from the hook and each chain across; turn. Row 2: Ch 3, dc in each sc across; turn. Row 3: Ch 1, sc in each dc across. Fasten off, leaving a 12” tail. Using a doubled over strand of yarn and a tapestry needle, sew the handle into the inner sides of the bag securely. The sample strap is sewn with about three inches of strap inside the bag on either side. 1. Cut many strands to about 25”. Organize into sets of three strands. 3. Continue this way, using three strands of fringe per stitch along both lower sides of the bag. 2. By hand or machine, sew the liner pieces together and turn the envelope inside out. 2. On opposite side of bag, attach two strands of yarn with a slip knot as done previously. Chain enough stitches to comfortably wrap around the button. Slip stitch to bag to form a loop. Fasten off and weave in end. A leather belt can make a great bag strap when affixed with some D-rings. The bag in photos above uses a thrifted leather belt attached with D-rings. Because the belt already had looped leather ends, I bent the D-rings enough to slide them in and then crocheted the D-rings directly to the bag. More often than than not though, you’ll need to use rivets to attach your leather strap. 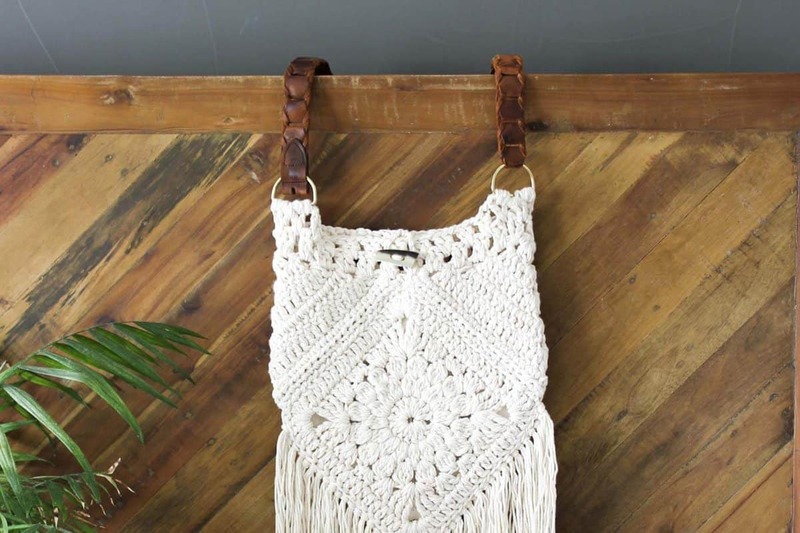 Persia Lou has an excellent tutorial for doing so in her own Boho Tassel Bag pattern. 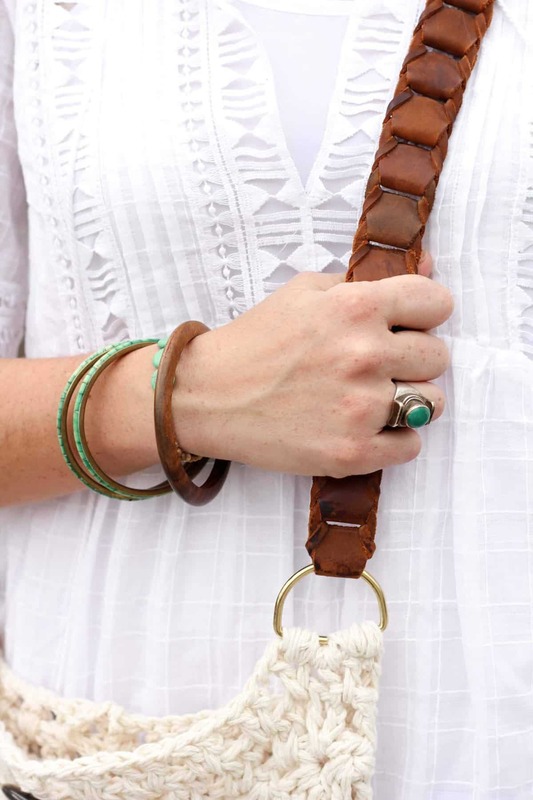 Take your inner free spirit out on the town with your new Urban Gypsy bag! 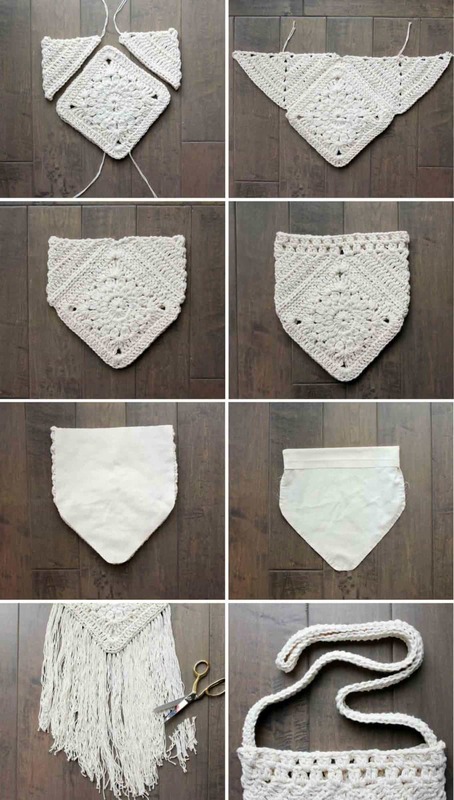 And here are some other free crochet bag patterns you might enjoy! 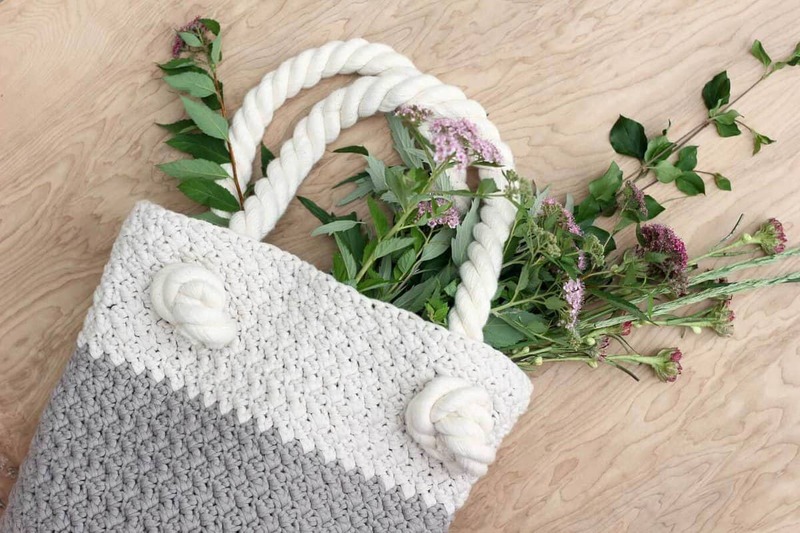 Finger Crochet Market Tote – with video tutorial! Suzette Tote Bag – great beginner pattern! I made the “Target” Boho bag and love. I can’t wait to make this one. I like style even better. Beautiful bag. I’m trying to figure out why I’m getting 45 stitches in the 3rd round instead of 32. Is there a misprint? RND 3 SHOULD ACTUALLY HAVE 48 STITCHES. Also is this two strands of worsted weight cotton? I am having the same problem, so on the 2nd row I put 2DC in each stitch and in the next I am putting 3 stitches so I’ll see how it works out, but something is off. but it is a beautiful bag, and I sure want to make me one. I wonder if the confusion is happening in the cluster stitch. All of the double crochets should be worked as a cluster, so you’re really only ending up with one stitch once they’re all crocheted together. (Check out the stitch explanation section for more detail.) 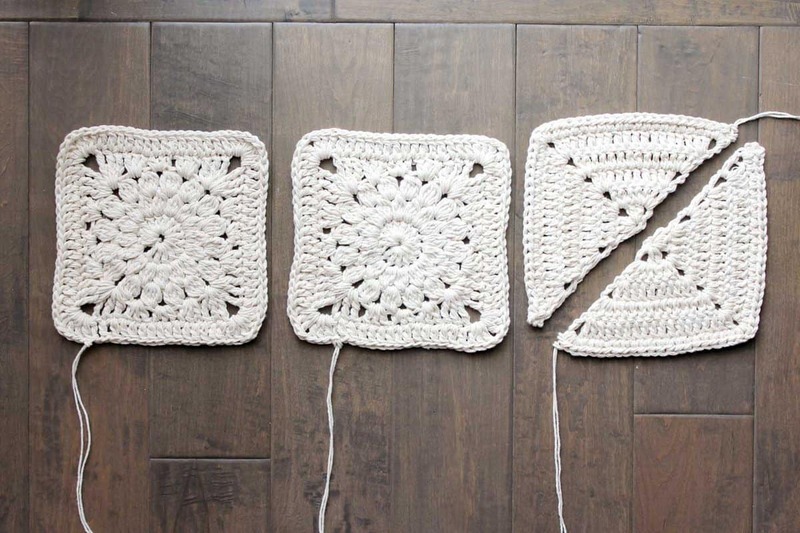 Because of this, each little section of double crochets only counts as one stitch in the stitch count. I just competed this and 32 is the right number of stitches. Also, you’re correct, 2 strands of worsted Wright cotton. I used the brand at Joann’s and it still looks great. I am having issues with this pattern as well. Too many stitches and not enough ch sps in the 4th round to make a square following directions. Am I doing something wrong? ? I had the same problem it wasnt making a square. When you start that round do your slip stitch, turn your work chain 4 then do your 2 trebles in that chain 2 space, chain 3 then do your other 3 trebles. Then continue the rest. Acho muito bonito vou tentar fazer. Bons trabalhos e um abraço. That is so thoughtful, thank you! Here’s a new link. I appreciate you thinking of me! This us so thoughtful of you, Jessica. Hi, round 4 has a error, it’s should have 3 triple, chain three then three triple in same space…not next space. Thanks for the pattern, looking great so far! There was a misprint when it came to making the square, there are supposed to be a cluster of 3 tr then chain 3 and then another 3 tr all in the same stitch. Yes! That’s true. Thanks for pointing it out. It should be fixed now. I would love clarification on the fourth row. I keep working and reworking it, but it is not coming out right. 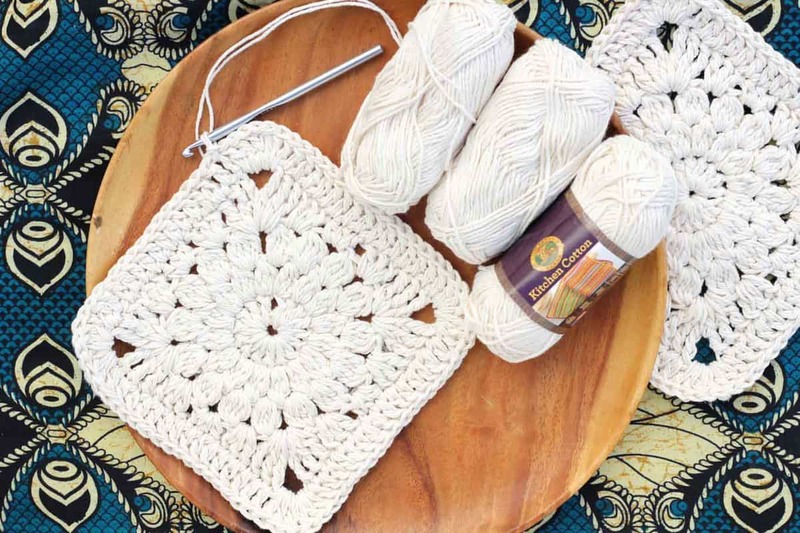 What “spaces” are you crocheting the stitches into? I’m on my 2nd square now, can’t wait to finish! There seemed to be an error in the round that “squares” each side; the only way I could get it to square with the number of bobbles in the previous round was to put the groups of TC’s with ch3 between them in the same spot, rather than the “next space” as the pattern calls for. Does that sound right? I realized that error as well and it should be corrected now. I hope you enjoy your purse! I love this bag. Thank you for sharing. My sons would say the same thing about me. My oldest is grown but we ended up having a later in life child. And for dress up days, especially retro ones, he loves that I make most everything from scratch, even his beads. I do cheat and use purchased jeans and turn them into bell bottoms with fabric to match his tops. But it is just as much fun for me as it is for him. And now I’m going to make this bag for myself so I can “dress up” too. I love that you make everything from scratch! I hope my own daughters can say that about me too! What a wonderful gift for your kids to grow up in a creative household. I sure feel lucky I did. I love this pattern so much! I’m in the middle of making it, and I ran out of yarn 🙁 Luckily I’m headed out to get more in the AM lol. Thank you so much for sharing! Haha–I hate when that happens! I hope you got back to crocheting quickly! Wow thank you so much for sharing this pattern. It is perfect for matching with my wicca outfits. I have got to buy yaen and make this! I’m not on instagram etc but be happy to share photos on my revelry once made, linking to your patteen of course. Thank you, Janie, I would love to see what you make! Your wicca outfits sound so cool! 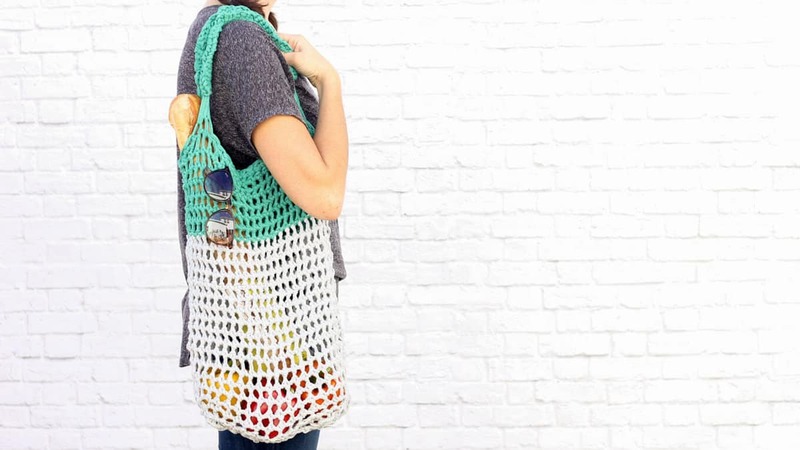 What happens if you realize your yarn isn’t cotton until after you crocheted the bag together? ??? Also, can anyone explain the sewing stitches? 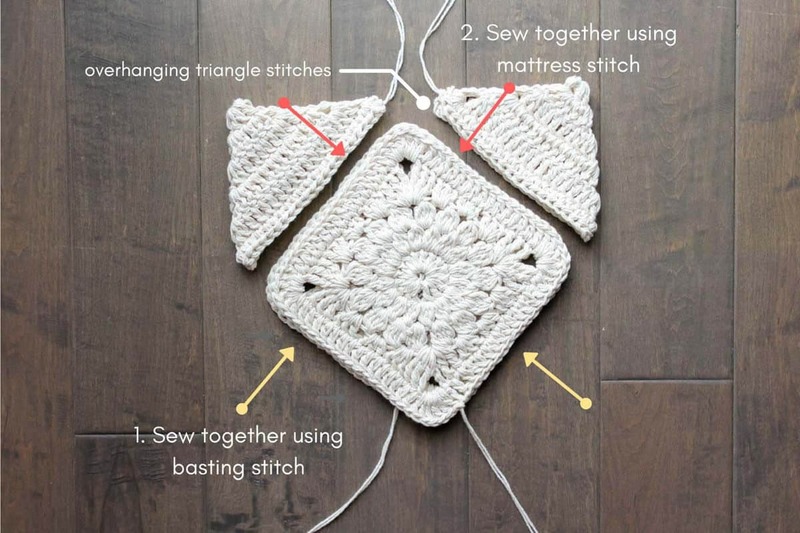 And do you use all 4 strands of yarn for the squares? And how? It’s totally fine that it’s not cotton. 🙂 Depending on what you used, it may or may not be stretchy. If you find it’s pretty stretchy though, adding the liner could help. Did you get the sewing stitches figured out? 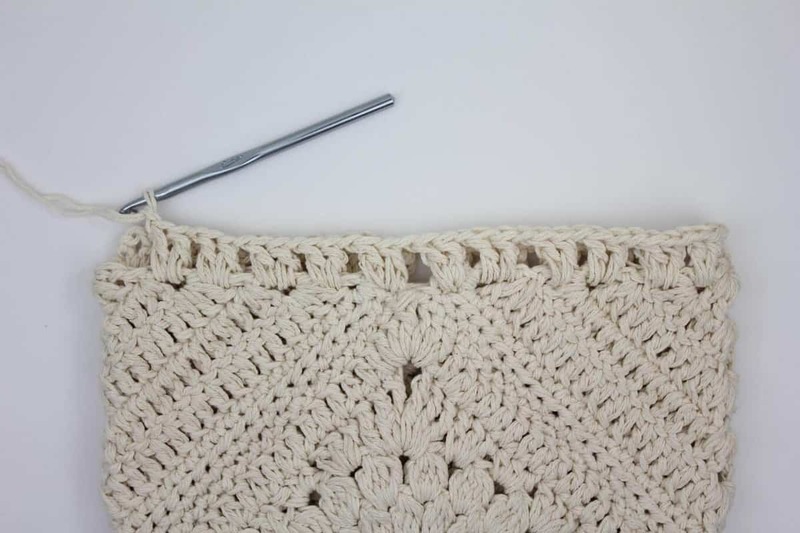 To sew the squares together, just use one long strand of yarn that is threaded through the needle to create two strands of yarn, tied with a knot at the bottom. Does that make sense? I have spent several hours trying to get this match up… and when I get to the trebble round, its all screwed up…..
I’m sorry to hear you’re having trouble! That sounds frustrating. Are you working on the round that turns it from a circle into a square? One thing to check would be to be sure you’re working all the corner stitches into one space. So you’ll do 3 treble crochets then 3 ch then 3 more treble crochets all in one space. You’ll do that in four spots to create the corners of the square. I hope that’s helpful. Please let me know if not! I’m a little confused on the triangle piece. After round one where does round 2 start? For the triangle, you’re be turning your work after each row. So you’ll make that initial foundation round and then work row 1. Turn your work. Then row 2 begins in the last stitch you worked from row 1. Let me know if you need more clarification! 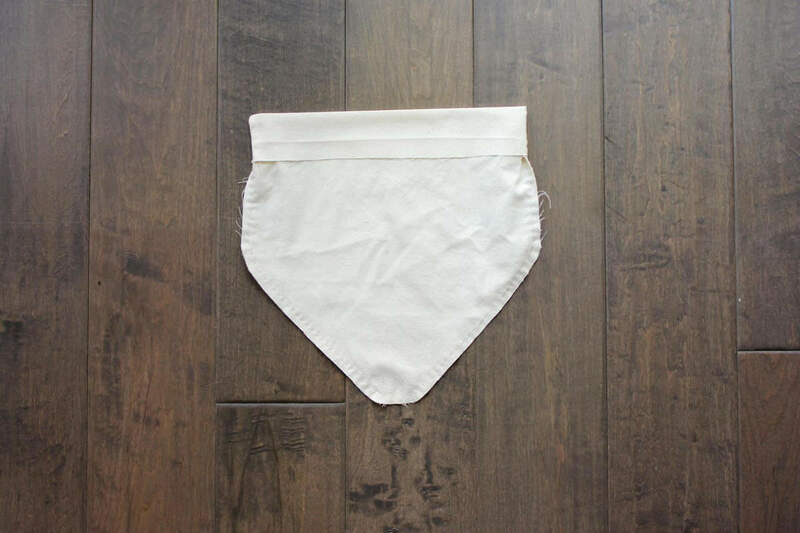 I cant figure out how to sew the triangle to the square. Help? I’m sorry to hear you’re having trouble. Are you struggling with lining up the pieces or the actual technique of sewing them together? Moogly has a great mattress stitch tutorial here that might help guide you if you’re new to seaming in this way. I’m so happy to hear they like them! You’re a pretty awesome sister for sharing your crochet skills. Have you made one for yourself yet?! Hi, I love the pattern! I have the squares done but cannot figure out the triangle. On round one it says 3 per side, what does this mean? When I turn on round 2 it doesn’t add up and I’m not sure where the corners are suppose to be. I’m assuming I shouldn’t repeat round one three times or join at the end. Starting in the round is confusing me I think. The 3 per side just means that there should be 3 dc on each side of the itty bitty “triangle” at that point. So you’ll have one side with the ch 3 and 2 dc and then you’ll have another side with 3 dc. Once you finish that row, it should look like a half-cirle-ish thing. Turn it just as if you were working flat rows and begin the next row right into the last dc stitch you just worked. I keep hav8 get to rip 4 and 5 out. I cannot end up with 15 and 21 to save my life. Giving up. I keep ripping it out and it is extremely annoying. I loved this bag. I’m having trouble on the 3rd row, when it says 3DcCl in first ch-1 sp, what’s it talking about when it says chain one space? Would this work with acrylic yarn? I have a bunch sitting here that needs a purpose and I’m having difficulty finding the right project. I love this! Thanks for making the pattern! Yes, I think it would. 🙂 The New Basic 175 yarn I used is 75% acrylic and 25% wool. Thank you so much for the awesome pattern! I made one for my daughter’s 21st birthday and just finished one for me to take on our trip to Italy. I modified the liner by adding a divider and 4 pockets inside to help organize all my ‘stuff’. My daughter and I LOVE the bags and have already gotten many compliments! Thanks again! I’m having issues with the triangle panel. For some reason it’s turning into a U shape rather than a triangle shape. Stitches are adding up on each side to what the patten says. Am I missing a stitch or do you have any suggestions? I really like this bag and think it would make a great bag for the beach. So I have included a link to it in a pattern round-up on my blog. When I discovered this pattern on your website, my head went into a spin immediately! Don’t get me wrong, there’s nothing wrong with it, I was just asking myself why I hadn’t stumbled upon this purse sooner… 😄😄I simply love the bag. I’m working on it right now, and just finished the first square. It only seemed fair to leave you a good comment and a thank you note while I take a short break. The pattern is very easy and very simply n neatly written. Though my square seems kinda strange from one corner-the last one(it has two ch-3’s here? )- but I’m continuing with this. I’m making it in baby pink, dirty green and off white combo. Simply because my Eid suit is a combo of those colours. (Besides my pink yarn was just begging me to use it for something special. About the leather and those D rings, however, won’t be able to get them on time… Amazon doesn’t ship to us anyway(you’ve got a fan in Pakistan 🇵🇰 now). Will send you a pic or link to my blog when done. Hello from Colorado, USA! I think your color combo is beautiful! This is going to be such a pretty bag. I’ll update the pattern now and please let me know if this solves things for you. Thanks again for your support and your great question! Hey Jess! Ya I figured it out (1st time I figured a crochet pattern part by myself. Yayyy!!!) and I also completed it on time for Eid!! However, lining and the handle is pending and I’ll do it tomorrow I think. But I need to add a lining. I took this strap from a bag I already have. It’s not bad, but I think a crochet handle would look better with this combination, don’t you? Besides, the bag is getting pulled up because of this handle. The yarn is loosing its elasticity and I don’t want that. Hope to find more stuff to do in these holidays! Maybe from your site, maybe from somewhere else. Let’s see. P.S. I used single strand through out the bag, which is why it needs lining. And I hope it’s okay for me to write a blog post on my website for this bag and link it to your pattern. My web below. Yours would be the 1st link I’ll be able to associate with my projects, since the rest of them were all printed patterns. Do visit the crochet section. I’ll update you when I feature this bag. Probably this weekend. I still have quite a stash of the most gorgeous aqua blue cotton. The color would totally fit the style, might make it look a bit native American. But it is Phildar Phil Crochet yarn, which is not the same weight as the Lion Brand Kitchen Cotton. Should I use 3 strands and a 6.5 mm crochet hook or is it going to look messy with 3 strands? Or should I try 2 strands and a 5 mm hook, and make the square bigger by adding more rows? Thank you for sharing your pattern. I’m almost finished making it and your instructions are perfect. I used pure white cotton yarn and I plan on dipping the finished bag into some RIT dye to create an ombré effect. I’m so happy to hear you’ve enjoyed the pattern as well! Absolutely LOVE this pattern! It was so easy & fun to crochet! I’m so happy to hear that, Cindi! I hope you love using your new bag just as much! Thanks for such a great patter! I am curious did you use one or two strands of yarn for the strap? I couldn’t find this anywhere? I’m confused on the triangle. Is it supposed to be stitched together or have a space when you turn? I tried four times before I gave up for the night. I’m not sure I understand your question, Priscilla. Do you want to give me a few more details on what you mean? I’d be happy to help if I can! Just double checking, is the crochet strap still with 2 strands held together? I am still having trouble with this pattern. I just printed it so it should be the updated instructions. When I get to round 2 it says to do a 3 DcC in each dc and I should end with 32. If I count each 3 DcC as 1 stitch I end up with 16 stitches. If I count each 3DcC as 3 stitches I end up with 48. How am I supposed to end up with 32 stitches? What am I doing wrong? 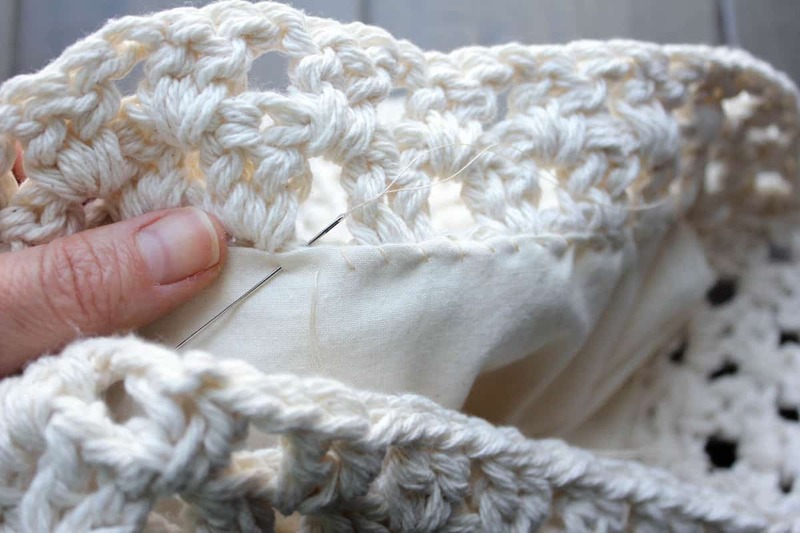 The clusters do count as one stitch, but the chains also count as one stitch. So it’s 16 + 16 = 32. Ok I’m sorry but I am still having trouble. I desperately want to make this purse because it is so cute. Now I am having trouble with the triangle. It ends up being 3.5-4” bigger than the square! What am I doing wrong now. I have made and ripped them both apart 4 times and I am continually having this problem. I am following the pattern exactly. My stitches are consistent. Do you fold the triangles in half? Either that or my triangles are way to big. My sisters birthday is on March 29th, she will love this if I can figure it out. Yes, the triangles kind of bend in half to form the sides of the bag. Hey, so I am having trouble with the counting, I am always off on the second row. One thing that I thought might help is if I could get some clarification on row two. My question is when we are counting to 15 clusters, do we count the very first 2DcCl, or do we ignore that one and just count the 3DcCl? Count that first 2DcCl one too! I have the pieces done but can’t seem to figure out how to put it together as far as putting the triangles on which is where I’m at now. Awesome! TKS! Mine showed up to be exactly like the ones I used to bring around with me in my younger days! My granddaughter is over the sky! Awesome my granddaughter is over the moon – mine showed unto look like the one I used to bring around with me in my younger days! 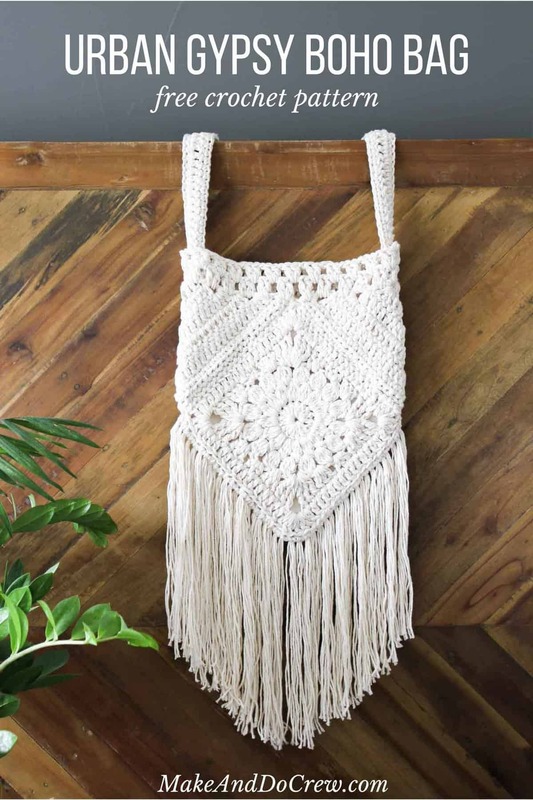 Just crochet a boho bag for me, thx for the pattern. Blogger Fie bakt, haakt en breit! HELLO! I love this pattern and bag! I found these awesome gold rings like yours and now im having trouble finding a way to crochet them onto the bag. Couldn’t seem to find anything in this pattern/post about how to do that? Thanks so much! The yarn that you’ve referenced above in the pattern is no longer being made. 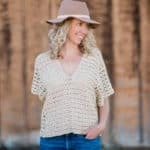 Would the Bernat maker home decor yarn work or would it be too stretchy? Definitely excited to make this to take on spring break!! Thank you! !